*This version includes a small number of final edits and corrections of typographical errors. 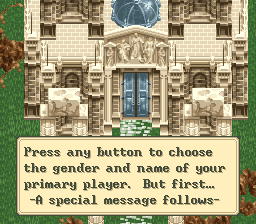 Our patch has also been modified to allow "universality" in playing options. It is compatible with Super Nintendo hardware and all premium SNES emulators. This version was hardware-tested via a Super Wildcard – DX2 "piggyback" configuration, using both floppies and an external Iomega 100 MB Parallel Port Zip Drive). We have also tested V1.01 with ZSNES151, several releases of SNES9x (including a version adapted to the Nintendo GameCube), an SNES emulator adapted to the NDS, and BSNES. Our recommended emulator-of-choice is BSNES. Thanks go out to Byuu for his advice and interest in the Mystic Ark project. Thus, the Mystic Ark English translation is re-released with these final updates. The mere sound of the word release is still almost incomprehensible. Due to the combined effort of many people over a span of 12 years, this high quality classic RPG that Enix never exported from Japan remains available to the English-speaking world, but with additional playing options. To the memory of Chris, founder and leader of RPGOne. Rest in peace, "Brother". The road has been long and unsteady. Several groups and individuals have worked on the Mystic Ark translation since 1997, but finally, the remnants of Transcore and Magic (Taskforce, Faraday, and Wildbill), Destiny (Wildbill, Necrosaro, The Gun, Shirley, Varkon, Robyn), Magic-Destiny (Taskforce, Wildbill, Draken, Akujin, and those already mentioned who are now inactive), and our most recent but critical additions to the team, Stealth Translations (Bongo`), and Red Soul, have succeeded. Building from Akujin's original patch (not Transcore's) that he constructed prior to joining the Magic-Destiny team and merging his efforts with M-D's built-from-scratch work (comprised at the time of a table file, a script dump, and a 45% translation of four blocks by Shirley, Varkon, Robyn, Faraday, and Wildbill), we are pleased to release Mystic Ark V1.01 under our new combined banner of Dynamic Designs, currently comprised of active charter members Taskforce, Bongo`, Wildbill, Draken, and Red Soul. Although Akujin has not re-established contact during the short time we have resumed work on Mystic Ark (MA), other seminal events have occurred hand-in-hand, most significantly, the merger between Stealth and Magic-Destiny Translations that yielded the Dynamic Designs name. Nevertheless, because Akujin created our original partial English patch, the one made available to the public for years on our download page, and because he also translated 55% of the original Japanese script dump, we are headlining Akujin as the senior member of the Mystic Arc team. That first dump included four huge files that comprised 80% of MA's Japanese script. Akujin also helped us identify and assemble many of the pieces of the puzzle that enabled us to resume the work in 2008 and reach a completed MA version quickly. Had we known it existed at the time, Akujin would have most assuredly translated the recently discovered fifth script block that was uncovered by Bongo' and Draken and translated by Mecha Gaijin. Our early efforts to complete MA ended around 2002 when Necrosaro suspended his work to construct an insertion program for the English dialogue, causing the project to languish for six long years! 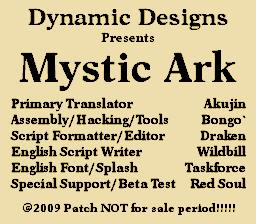 But Mystic Ark English is just as fine a game in 2008 as it would have been in 2002. As I (Wildbill) got caught up in game play, I became so entranced by the zany characters, the tricky puzzles, and the elusive premise of this RPG's storyline, I forgot all about my appetite for the fancy accoutrements of modern ROM-driven games. Yes, MA almost cries out for porting to NDS! Taskforce hand built our unique English font for MA's main English dialogue. We reviewed numerous variations prior to choosing our final version. Starting with a 16X16, we settled on and 8X16 so we could average about 27 to 28 character per line (CPL) of dialogue. With around 31 CPL available in Feda (but only three lines per page), with 27 CPL to use in all four lines of MA, we avoided adding numerous new screens. The splash went through several evolutions because of space limitations. Red Soul designed a nice looking initial page, then, Taskforce took it from there and tweaked it to perfection. Sadly, those fancy initial splash pages had to be whittled down to the final version you see in the game due to those space constraints. We packed the ROM with so much data, we were lucky to set one in stone at all, but it worked out in the end, and that's what counts. 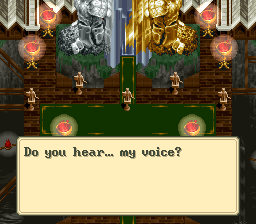 Certain game mechanics and character designs are similar, but Mystic Ark (MA) is not a sequel to 7th Saga. The latter game takes place on Planet Ticondera and involves time travel. MA is centered in a mysterious, deserted island shrine, a convoluted complex that features numerous portals into other realms that a solitary awakened player must unlock, explore, and solve in what unfolds as a huge, diversified 60-hour puzzle! 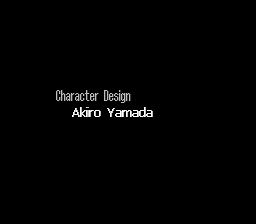 Although a number of clues seem evident in hindsight, the final MA mystery remained unsolved until the final scene in the game, one that followed the lengthy ending credits. Several years ago, one MA reviewer wrote that the Japanese version lacked a plot or story that made sense. 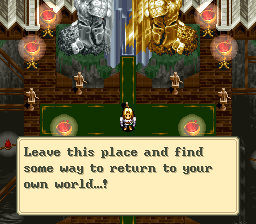 Perhaps that player turned his game off at the conclusion of the last battle and missed that final resolution, because that's when everything clicked into place for the translation team, along with the realization that MA's allegorical story was revealed in bits and pieces, fitting its overall puzzle-like nature. The release of the Mystic Ark English patch is satisfying on many levels, but the crew is ready to move onward to fresh work. My sincere thanks go out to all. To Gideon Zhi for offering technical information. We had long since solved the issues related to the information he provided, but we appreciate his gesture just the same. To Byuu for showing an interest in this project. He was a big inspiration during our efforts to produce this universal patch that works with real SNES hardware.